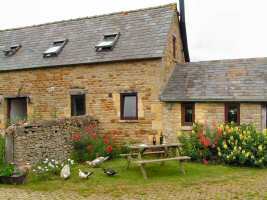 Stable Cottage is the larger of the two self catering holiday cottages at Blackpitt Farm near Stow on the Wold in the Cotswolds, comprising 2 bedrooms, one double and one twin. Sleeping four to five people (there is a sofa bed as well), this is just right for family holidays or a country retreat with a group of friends. On the ground floor is the kitchen dining area, a stone arch leads through to the wonderful sitting room. The kitchen embodies a typical farmhouse style with an electric oven and hob, fridge with freezer compartment, microwave, dishwasher, kettle & toaster. 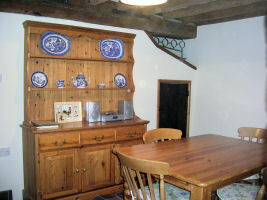 The dining area has a pine Welsh dresser and matching table and chairs. A great entertaining space and equally ideal for family dining. 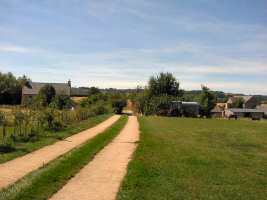 The cottage has Broadband access and the hot water is heated by solar-power (with boiler back up for those not so sunny days). 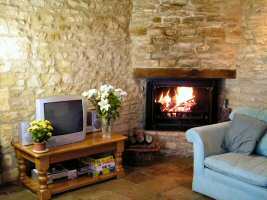 The separate sitting room has a lovely open fire stocked with a basket of logs. 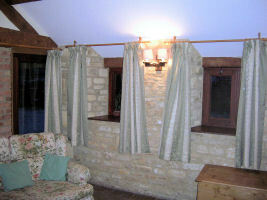 The limestone walls are original as is all the timber work and beams. Don’t be put off walking on the stone tiled floor in bare feet, the cottage is kept lovely and warm with underfloor heating throughout. There is freeview TV and DVD player. 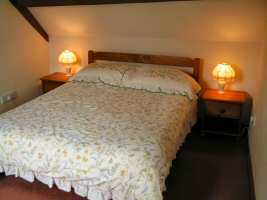 There is also a sofa bed with linen provided for extra guests. The main double bedroom is located on the first floor. It’s “up in the eaves” feel contributes to a true country atmosphere, as you remember the cottages former use as a milking parlour. Stable Cottage has the perfect view to wake up to; far-reaching green fields scattered with a few church spires and woodland. There is a built in timber wardrobe and all bed linen is provided. 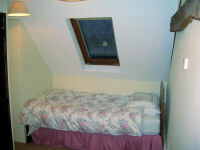 There is also a twin bedroom with views over the garden opposite and the Gloucestershire countryside beyond. 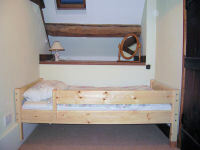 One of the beds is a childs bed which is slightly shorter than normal but ideal for children or small adults. There is a chest of drawers and bed linen is provided. The bathroom features a concealed cistern toilet, wash hand basin with half pedestal and illuminated mirrored cabinet and bath with shower overhead. 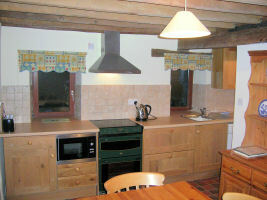 A heated towel rail and underfloor heating have been added for your comfort. 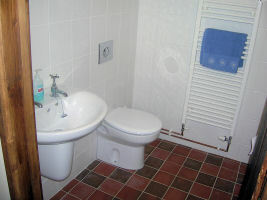 The bathroom is located on the ground floor. Personal towels are available on request at a small charge. friendly ducks, however watch out you don’t end up sharing your picnic as well!